I think both parties focus on the negatives of the opposing candidates. It’s politics. This only proved to me that Obama is nowhere near superior regarding intelligence. I think they’re just much different in terms of experience as well as views and opinions. In fact, he could have been the ‘bigger man’ and dodged the negativity coming from the other side. A lot of women were taken aback from this statement that Obama so “eloquently” put together while rubbing his eyebrows. I actually believe by his body language alone, that someone egged him on to say this against his best judgment. Watch the Youtube video of it. It’s interesting to watch him say this while his body language says the complete opposite. And yes, I'm giving him the benefit of the doubt. If he did say this statement on his own judgment, then his true colors are really coming up to the surface now. I love studying human behavior. I watch what each candidate does while making a speech. No doubt, speaking in front of millions of people who may or may not agree with you has to be the hardest thing to do. Whenever I watch Obama speak, I find that he stutters and paces. He fidgets. Does anyone else notice this? Now that time has passed and the election is coming up, he appears to be worn out (as any candidate should be), and he looks almost “sick and tired”----which possibly led to that awful statement against Palin as well as all women across the board in my opinion. He doesn’t appear confident and ready. That makes me nervous if he does get elected to be our next president. 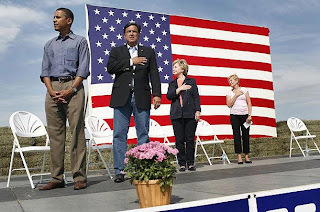 With Obama’s body language alone, the lack of confidence he appears to have, the st-st-st-stuttering and fidgeting that goes on during his speech as well as his ignorant remark against Palin and all women---should he really be our next president? As I've said once before on this blog: body language has a lot to do with true feelings. This last video scares me.